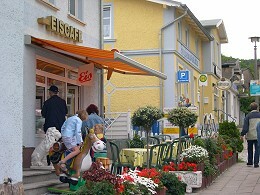 Our Café has been started in May 1991 and has been well - known outside the isle because of be its ice - cream specialities. We make our ice - cream by ourselves in our ice - cream laboratory. The quality is very important for us and so we don't use colouring and preservation matters and we care much about the freshness. Obviously we have a high pretension in hygiene, which is very important for the production of our ice - cream. Our ice - cream menu is very manifold and comprehensive. You'll find out speciality ( "Sanddorn" - ice - cream ) alternative cups, diabetic cups, ice cream beverages, fitness cups and cups for children. Our newest menu has been produced with the most popular specialities of the last years. Well, come in and let you spoil. 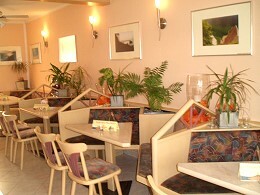 Our café is daily opened for our guests, only in the late autumn until the spring we have a winter break. In our café there is a sitting capacity of 28 and as soon as the sun will shining our terrace will be opened, from which you can watch the colourful scene of activity in the Harbour-Street. All cups of ice cream you can also take home, of course. So you can make your friends and acquaintance happy with a fresh surprise.